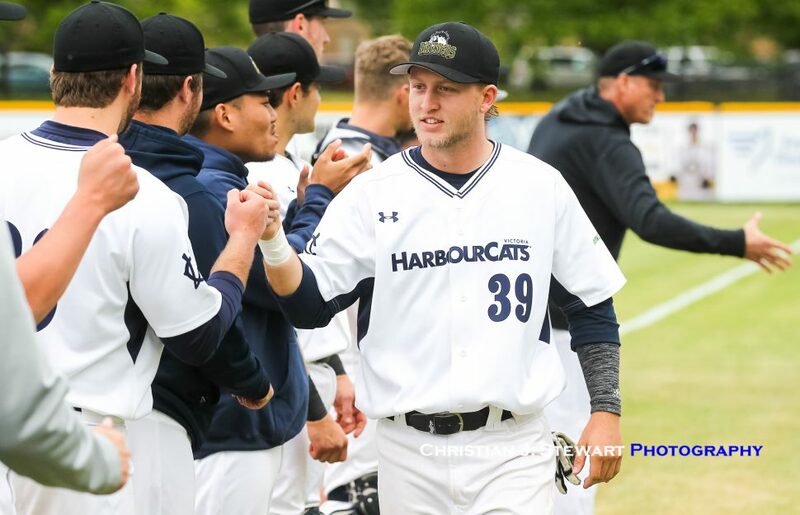 June 12, 2018 – Behind the bat of outfielder Nate Pecota, and resiliency from the bullpen, the Victoria HarbourCats clawed to their first road win of the season against their B.C. rival Kelowna Falcons in a 13-7 10 inning victory in the Orchard City. Despite the score alluding to a blowout win, the game was tightly contested from the start. Adam Imwalle drew first blood the for the HarbourCats in the top of the third, the seventh straight game Victoria has crossed the plate first, scoring Pecota on a RBI single. But, the Falcons countered with four runs in the bottom half, highlighted by Stephen Torgensen’s RBI double to make it a 4-1 game early on. Making his second start of the season, Conner Nantkes did little to help his own cause in the Falcons’ four run inning. Despite the Washington State product surrendering a leadoff single, Nantkes recorded two quick outs to get one away from avoiding the inning unscathed. However, consecutive single, double, singles propelled Kelowna to a 3-1 lead, and a wild pitch from Nantkes opened the Falcon lead to three before he got a pop-out from Taylor Wright to end the inning. That was all Head Coach Brian McRae needed to see from his starter, as to begin the next inning he tapped reliever Michael Stovman out of the bullpen. Nantkes finished with give hits, four earned runs, and four strikeouts in three innings pitched. While the pitching had trouble early on, newcomer and William-Jewell university native Nate Pecota had little trouble at the plate. McRae must enjoy having Pecota as the table setter atop the line-up, in all five starts for the centerfielder he has batted first, and he didn’t disappoint tonight. The outfielder finished with four runs, three hits, and six RBIs in five at-bats, along with two stolen bases. The three hits tonight almost matched his season total for hits (4) coming into the game, and upped his average to .389. Stovman would keep the visitors within striking distance, firing four innings of one-run ball, and exiting the game in the eighth with the score tied deadlocked at 5. After taking a 7-5 lead in the top half of the seventh behind a RBI double from Cade Brown, Ping-Chun Ho was called out of the ‘Pen to preserve the lead in the eighth. Ho, making his third appearance of the season, would load the bases for the Falcons in the inning, and proceed to give up four hits and two earned runs in just a single inning pitch to even the game at 7 a piece. After a scoreless ninth frame, the HarbourCats entered the 10th in what would be their first extra-innings game of the year, where the Nate Pecota show carried on. Infielder Nick Plaia got the action started with a lead-off walk, and set the stage for Pecota to send him home with a two-run double. The ‘Cats would send 11 men to the plate in the inning, and scored six times to take a commanding 13-7 lead. Gunnar Friend, who entered to pitch in the ninth, would only surrender a single hit in two innings pitched to preserve the first road victory for Victoria. The win brought the HarbourCats back over .500 to 4-3, and they will look to take the series victory as the two teams will renew hostilities tomorrow night at 6:35 p.m. for the middle-game in Kelowna. Visit the Victoria HarbourCats Facebook game to live stream the game on Facebook Live, or visit the Kelowna Falcons website to listen via audio.